A breathtaking journey across the face of a living glacier! Tour includes round trip transfer from dock; raingear and life jackets; snack consisting of reindeer sausage, cheese, crackers, salmon spread and water. Complimentary souvenir button. T-shirts and hats are available for purchase. 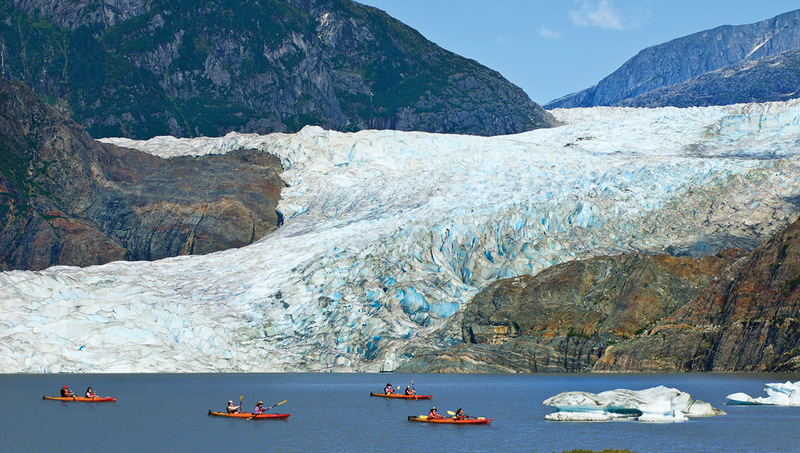 Be among the select few, under a limited USFS permit, to kayak near the face of the majestic Mendenhall Glacier. Your guide will teach you kayaking techniques, then board the two-person kayaks, with either a new friend or traveling companion. 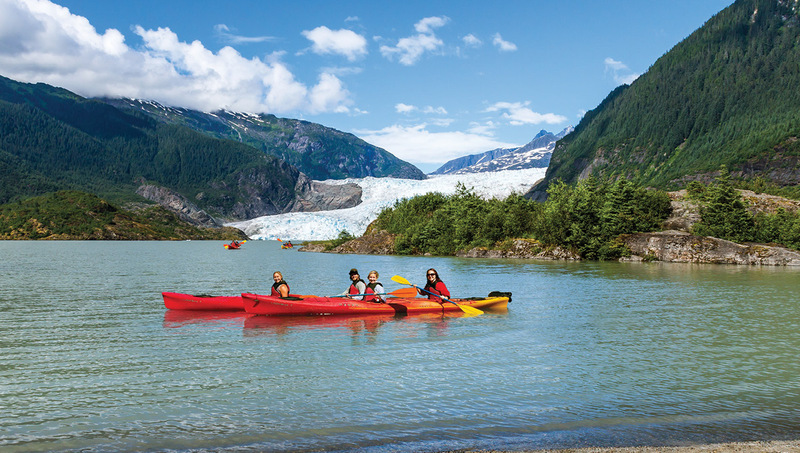 Journey across Mendenhall Lake in your stable kayak, navigating the iceberg studded pristine water that is truly one of the jewels of the Tongass National Forest. 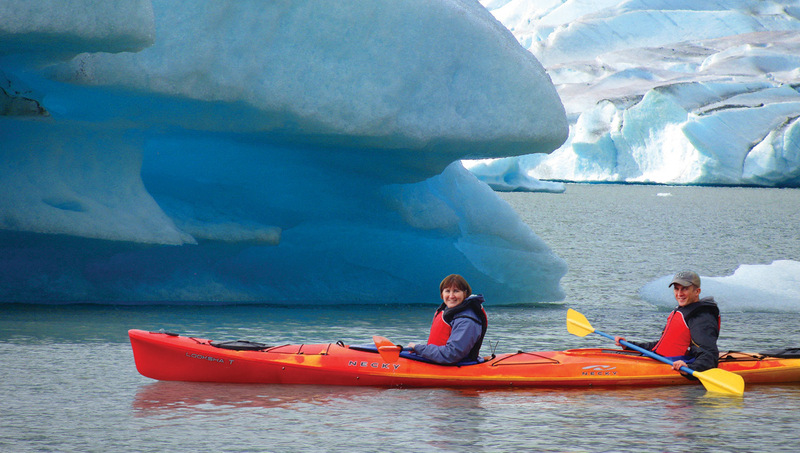 Your guide will explain the breathtaking nature surrounding you and the history and ecology of Mendenhall Glacier. Venture within a safe distance of the massive, awe-inspiring face of the glacier and skirt the base of the beautiful and powerful Nugget Falls. After paddling back across the lake, refuel with an Alaskan-style snack. Notes: No prior experience necessary, however moderate to good physical health is recommended as guests must paddle for approximately 2 hours and climb in/out of the kayak with limited assistance. Maximum weight is approximately 275 pounds and is dependent on waist size to fit into the kayak cockpit. Children must weigh at least 40 pounds in order to fit into required life jackets. Children under 12 must be accompanied by an adult. Children ages 13-17 must have a signed parental consent form to participate in the absence of a parent or guardian. We recommend bringing an extra pair of socks and gloves to protect your hands during the paddle. This tour operates under a special use permit with the USDA Forest Service and is and equal opportunity provider. 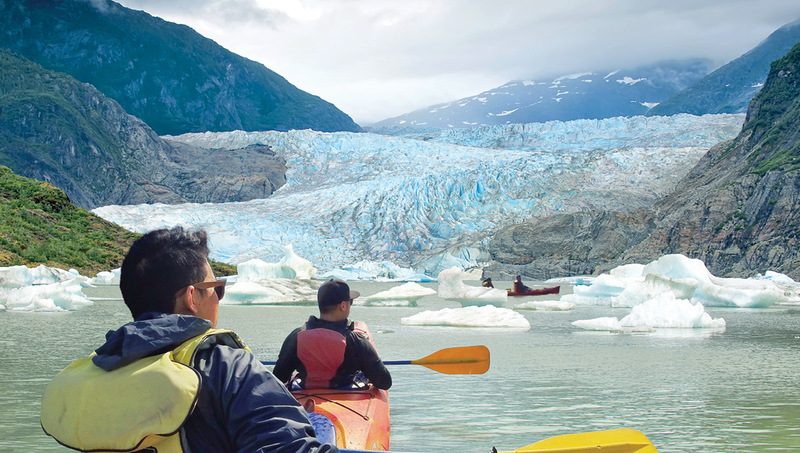 Be one of the lucky few to experience the majestic Mendenhall Glacier up close, as you travel by kayak, under a very limited U.S. Forest Service permit. Upon arrival at Mendenhall Lake, your experienced, friendly guide will help you with life jackets and rain gear before teaching you kayaking techniques. Then you will board the two-person kayaks, with either a new friend or traveling companion, and set off on your Alaskan adventure. 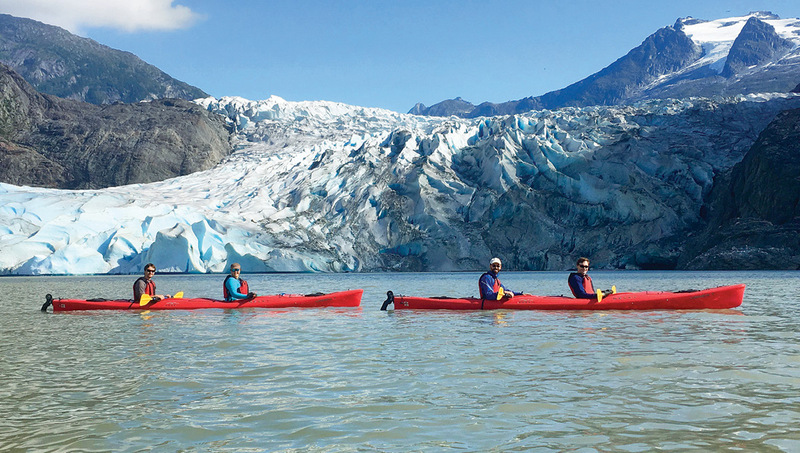 Journey across Mendenhall Lake in your stable kayak, navigating the iceberg studded pristine water that is truly one of the jewels of the Tongass National Forest. Your knowledgeable guide will explain the breathtaking nature surrounding you, pointing out native wildlife and fascinating you with the history and ecology of the spectacular Mendenhall Glacier. Venture within a safe distance of the massive, awe-inspiring face of the glacier and skirt the base of the beautiful and powerful Nugget Falls. 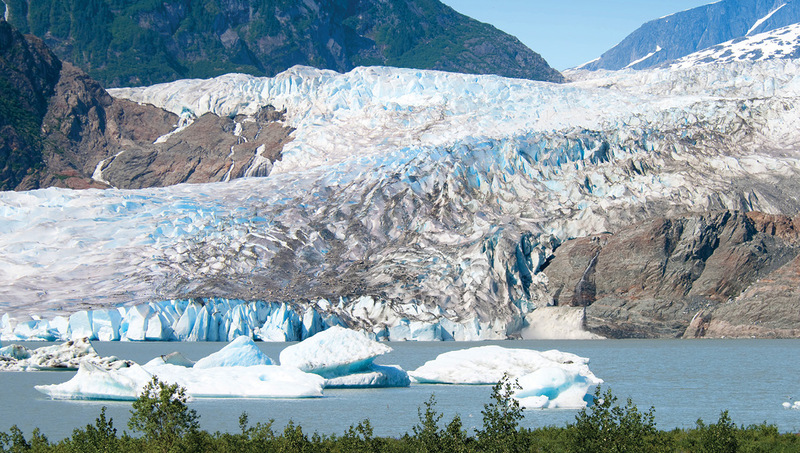 After paddling back across the lake and taking in the last views of this extraordinary glacier, refuel with a snack of Alaskan-style fare and reminisce about the experience that is sure to be a highlight of your Alaska vacation. Never paddled before? Don’t worry! Your experienced guide will group you into like abilities, so that you can travel at a comfortable pace, while ensuring that your adventure is safe and enjoyable. Don’t miss this opportunity to experience the Mendenhall Glacier as only a select few lucky adventurers can.